Given a triangle structure with white and black fields inside you must find the largest triangle area of white fields, as shown in the following figure. 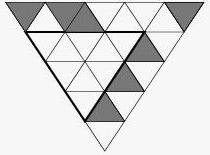 For each triangle, the number of the characters `#' and `-' per line is odd and decreases from 2n - 1 down to 1. The input is terminated by a description starting with n = 0. For each triangle in the input, first output the number of the triangle, as shown in the sample output. Then print the line "The largest triangle area is a. ", where a is the number of fields inside the largest triangle that consists only of white fields. Note that the largest triangle can have its point at the top, as in the second case of the sample input. The largest triangle area is 9. The largest triangle area is 4.